Eruption of Mount Rinjani in Indonesia in 1994. Credit: Oliver Spalt. Well, it’s been a while, but it’s finally time I got back to my What If? Rejects series, where I answer the questions that Randall Munroe declined to answer in his book, What If? Previous post in this series: Umm…? Q: Would it be possible to stop a volcano eruption by placing a bomb (thermobaric or nuclear) underneath the surface? My response: No. Dropping a thermobaric bomb on a volcano would do very little. Dropping a nuclear bomb on a volcano would get you…a radioactive volcano. A thermobaric weapon is a type of explosive powered partially by oxygen from the air. For example, a fuel-air bomb creates a aerosol of gasoline that burns explosively in the air. This is in contrast to most types of explosives, like gunpowder, in with the oxidizer is the saltpeter in the powder. Thermobaric weapons do not need to carry oxidizer, which saves weight and makes them more powerful per unit weight. Thermobaric weapons are also particularly destructive and deadly because they burn very hot, and the subsequent cooling of gases causes a partial vacuum, which causes negative pressure winds towards ground zero, and can damage lungs. The largest thermobaric weapon in the world is the Russian Aviation Thermobaric Bomb of Increased Power, or “Father of all Bombs“, which has a yield of 0.044 kilotons of TNT. A nuclear bomb, obviously, uses a chain reaction of radioactive decay or nuclear fusion to create a much larger explosion. The Little Boy bomb dropped on Hiroshima had a yield of 15 kilotons. The largest nuclear weapon ever tested, the Russian Tsar Bomba, was over 3,000 times more powerful, with a yield of 50 megatons. 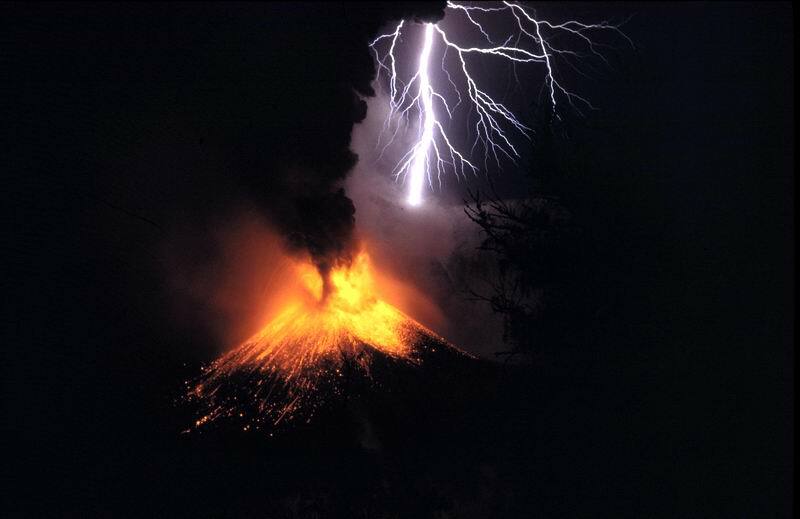 A large volcanic eruption is as powerful and explosive as a large nuclear bomb. For example, the 1980 eruption of Mount St. Helens released about 24 megatons of energy, blasted down millions of trees, caused massive mudslides, superheated rock-filled blast waves, and other mayhem. I fail to see how nuking it could make that better in any respect. This entry was posted in Geology, What If? Rejects and tagged nuclear weapon, thermobaric weapon, volcanoes. Bookmark the permalink.